OK, I know that it is way, way too earlier to be looking at stats. But this is just too pretty to pass up. 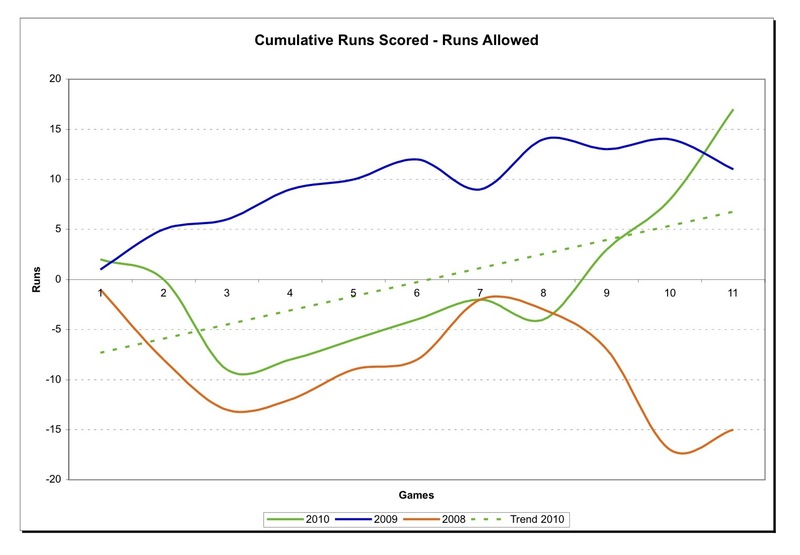 This is simply the cumulative number of runs scored by the Bulls minus the number of runs they have allowed, on a game-by-game basis. That is, as of today, the good guys (that would be the Durham Bulls) have scored 17 more runs than the bad guys (that would be everyone else). What is the point? Well, the curves are right pretty ... as we would say down here. 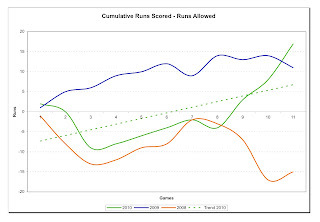 And then there is the oddity that there is a spooky match between the general curve of runs scored-runs allowed and games above/below .500. But mostly, at the moment, it is just a pretty set of curves. And Eliot Johnson & Ruggiano have been something purty to watch recently, haven't they?